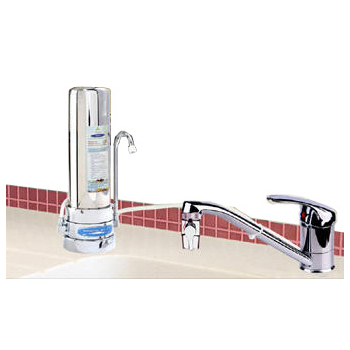 Mega Stainless Steel Single Replaceable Cartridge Countertop Water Filter by CRYSTAL QUEST is a kitchen counter system equipped with a 6-stage filtration replaceable cartridge. The system sits side by side with your faucet giving you an instant option to have filtered and none filtered water in one location. 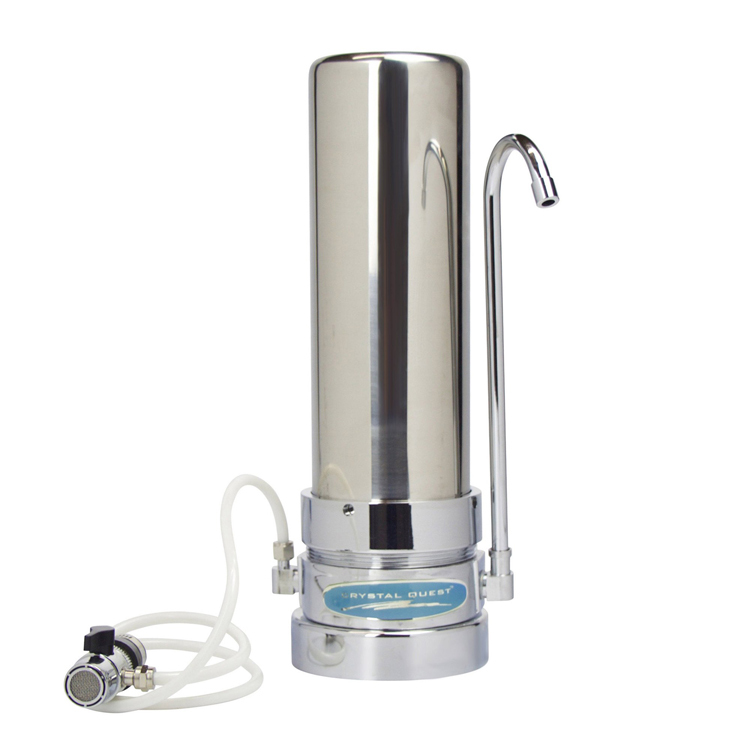 It offers great taste and pureness by eliminating impurities of tap water. The perfect solution for any household, it is quick and easy to install - attractive, convenient, and effective system that removes many contaminants from water. It's stainless steel finish provides elegance and modern texture to your kitchen. 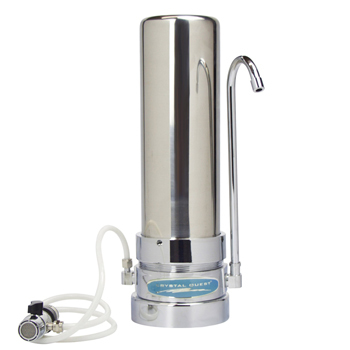 This System provides a flow rate of 0.5 gallon per minute. It can accommodate a filter with a 10,000 gallon, 20,000 gallon, or 30,000 gallon capacity, depending on your choice. Control water flow from unfiltered to filtered easily using its designated diverter valve that comes with the package. Great for homes, apartments or office use. Made in USA, real stainless steel housing! A diverter valve near the aerator switches between filtered and unfiltered water. Easily connects to any kitchen faucet. Installation requires no tools on any standard faucet(Counter top filter installation instructions). 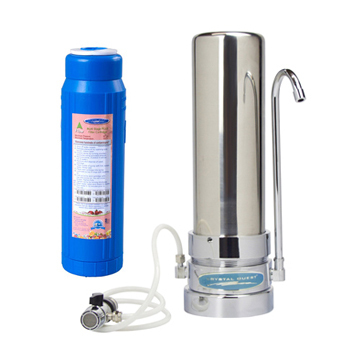 This solid state water filter uses the latest technologies that blend the adsorption capabilities of coconut shell activated carbon (GAC) with Eagle Redox Alloy and more. 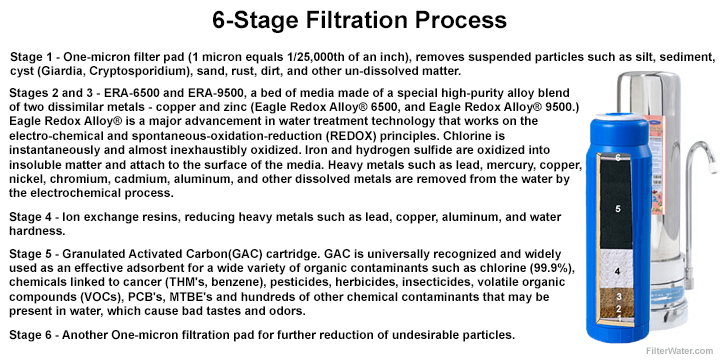 * Stainless steel filtration systems may need periodic maintenance to prevent corrosion from hard water, water with high levels of nitrates and high levels of iron. To prevent and rid your system of corrosiveness, quarterly cleaning should be done. This can be done using 9% white vinegar and warm water. Sumps and caps (as applicable), should be cleaned and rinsed well. * This product is manufactured using Ion Exchange Resins that meet standard ANSI 61/42 WQA Seal Certified, GAC which meets standard ANSI 42 NSF Certified, KDF which meets standard ANSI 61/42 Certified, and pre and post one-micron filter pads which are from ISO 9001 approved manufacturers. 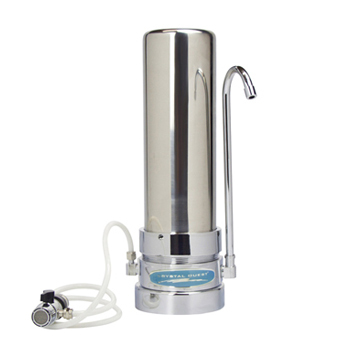 Countertop Water Filter Stainless 20"